When we first arrived in Logansport, Indiana, on January 17, 2019, we stayed for about a week at the Holiday Inn hotel here. We were looking for a place to rent, and it took a while to find a place and get the agreement signed and all. In our room at the Holiday Inn, they had a Keurig K-Cup coffee brewer. I had heard of K-Cups, but never tried them, as far as I know, they are not available in the Philippines. At the very least, they are rare there. Since the weather was quite cold for us, we drank coffee several times per day or more! In the Philippines, where we had been living for nearly 20 years, the weather was hot. Getting hit with an arctic blast meant that having a nice hot drink was essential for us! At first, we were a bit intimidated by this “new-fangled” machine, but we quickly figured out how to use it. The hotel not only had the Keurig brewer, but a selection of K-Cups to choose from, and they kept the selection replenished daily. It got to the point where we would use up all of the K-Cups that they left in our room! I never really was a big coffee drinker until maybe 7 or 8 years ago. A friend introduced me to the hobby of home coffee roasting. I enjoyed it and found the coffee delicious. I liked the freshness of the beans and would roast enjoy to last me just a week, so I always had freshly roasted coffee in the house. So, switching to coffee that had been pre-roasted was not natural to me. I tried out the K-cups, though, and I liked the coffee. Liking the flavor of the coffee combined with the convenience of brewing a single cup of coffee quickly (and without a big mess to clean up) made me like the K-cup machine. After we moved to our house from the hotel, I ordered a Mr. Coffee drip brewer from Amazon. I also ordered a selection of roasted coffee grown in my favorite origins (Indonesia and Rwanda). The coffee tasted fine, but it was not as convenient as the k-cup brewing, and there was also more of a mess to clean up. Also, the Mr. Coffee that I ordered was smaller than I thought, and really only made 2 cups of coffee, which I found lacking. In the back of my mind, I kept thinking about how nice and convenient that Keurig Coffee Brewer was back at the hotel, and I wanted one. I am the type, though, that if I buy something and then decide I wished I had ordered a different model… well, I am resistant to admitting my mistake and buying what I should have purchased in the first place. Our son, Aaron, is living in Atlanta, Georgia. I talk to him a couple of times per week on the phone. One day I mentioned the Keurig to him and he started telling me about a problem with the Keurig 2.0 coffee brewers. He explained that with the newer 2.0 models, Keurig had made it where you could only brew genuine Keurig brand k-cups. However, he also told me that there was a hack to “fix” the problem. Aaron is the type that likes to tinker with things, and he is good at it. Myself… I prefer to leave things alone and not “mess them up”. Aaron was telling me about how to hack it, you had to open it up, cut wires, etc. That did not sound good to me. I went on YouTube and found some videos about the hack that he found, and did not feel comfortable with doing it. I also, though, found some simpler hacks. 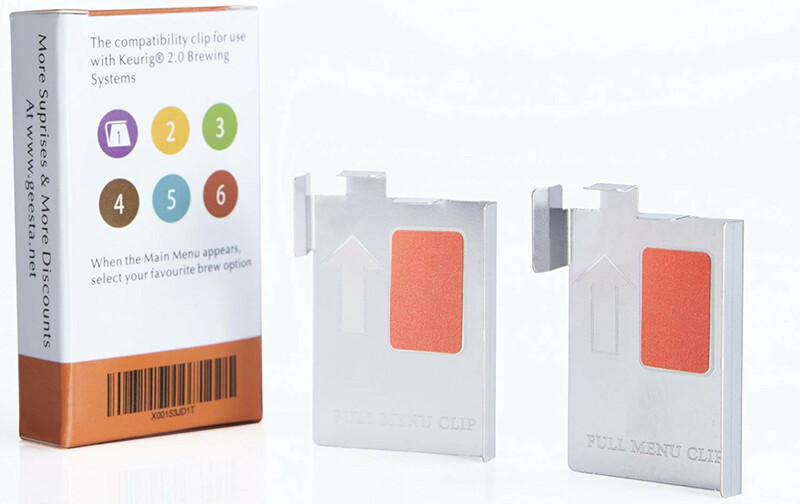 All you had to do was put this clip over a sensor, and an orange pad into a little slot, and boom, you could use any k-cups that you wanted. One day, a couple of weeks back, Feyma mentioned that she kind of wanted one of those k-cup brewers that they had in our hotel room. That was all I needed to convince me. We ordered the Keurig the next day. We chose a nice Cashmere Grey Keurig K-Cup brewer that matched our decor in the house. We also ordered a variety of k-cups to get us started. The coffee maker arrived in 2 days (I have Amazon Prime), and we hooked it up. 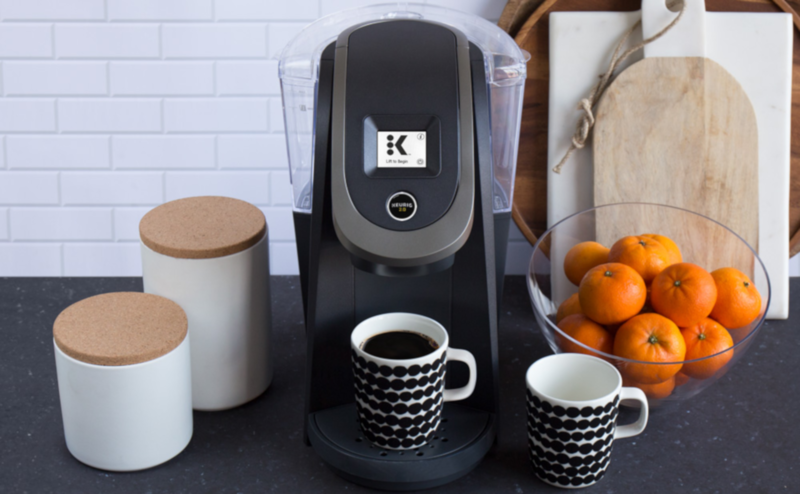 Started brewing K-Cup coffee, and we love it! It is so easy to use. Also, I like it that you only brew one cup at a time. You can enjoy different coffees with each cup, and do it easily. Also, if Feyma wants one type of coffee, and I want something different, it is simple to just brew a different cup for each of us. Additionally, after you brew your coffee you just throw away the k-cup and you are done! No big clean up. The k-cup brewer even has a water well that is good for like 6 cups of coffee or so. Very convenient! Really, the Keurig K-cup brewer is probably the most used appliance in our house. We use it many times every day. We are loving it. We had one of those where I worked ( Worked ? yes, I retired first of this year ) . Nice machine and you could use any brand of K Kup in it. Nice machine and I think it could easily make Mr. Coffee a has been. So many varieties of coffee in the K Kups gives a lot of choices. Enjoy it Bob as another welcome back to the USA ! Hi Bob. I did not know you retired! Congratulations! Yes, we are really enjoying the Keurig! In fact, I think I’ll go make a cup right now! Out of curiosity I looked at the Youtube videos of how to bypass the Keurig Only cup sensor. Just remove a panel and clip the green wire. Another work around is put an authentic K Kup lid on top of a non Keurig cup and it will work just fine. I guess they were loosing a lot of cup sales to off brand and store brand cups. I used to buy store brand cups for the one at work for about half the cost of the Green Mountain ( Keurig ) cups. You can also have the best of both worlds if you like, roast your own and K-cup. Buy a k-cup look a-like that you put your own coffee into. I like this because it is hard to find my favorite coffee (Kenya AA) in k-cups. Amazon had a supplier of Kenya AA in k-cups (Barry House), but they quit selling it about a year ago. I also like the hot chocolate in the same machine when it’s really cold outside. I have to admit, though, I also have an espresso machine in my office. Making the coffee is itself a break from sitting front of the screen. Hope the weather – snow and then flooding isn’t too bad there. It’s finally starting to warm up here. Hi Tony – Yep! I already have one of those k-cups that you put your own grounds into, and I think I will roast my own beans from time to time. I also like the Kenya AA, it is great. 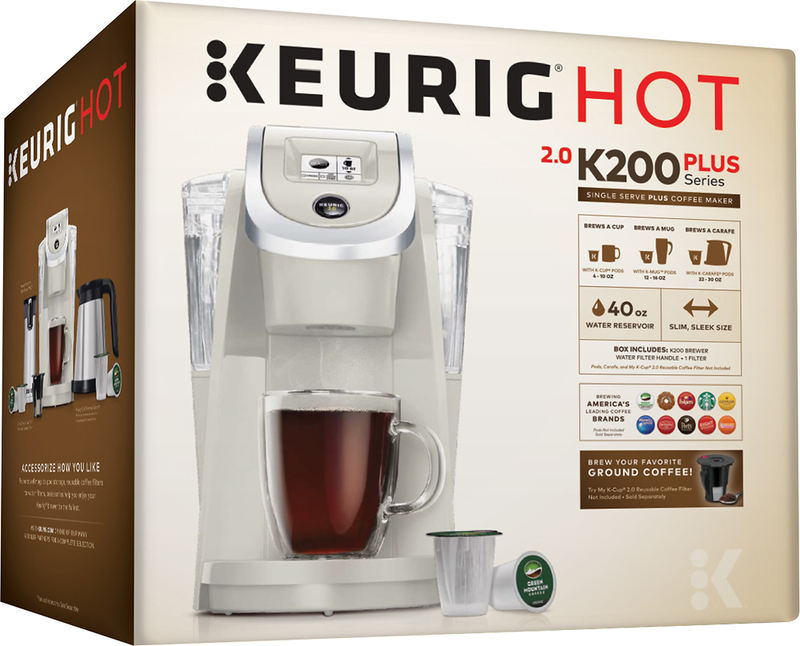 My wife and son drink Hot Chocolate a lot, and we use the Keurig to make that too! We have been getting snow several times per week still.. hoping that will go away soon! I am sure you are getting it in Montana as well. I’m not a coffee drinker but bought a Hamilton Beach pot for my son. On one side was a 12 cup coffee maker, on the other side is a k cup maker, they love it. I have seen those combo type coffee machines. Look pretty nice!